To every creature there is a season. At the beginning of May, the blacktail doe that hangs around on this hill brought out both of this year’s fawns for the first time. 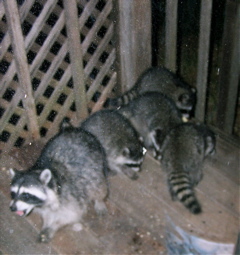 Sunday night, it was Mrs. Raccoon’s turn to bring out her four kits. 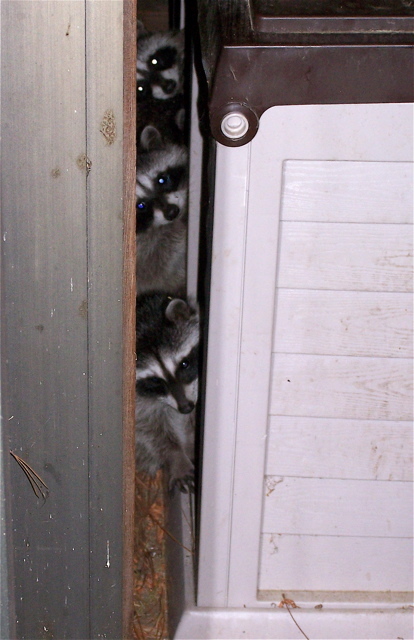 My kitchen door has become a regular stop on Mrs. Raccoon’s evening rounds. From the first time she showed up a couple of years ago, her begging has mainly consisted of standing on her hind legs with her front feet on the glass of my kitchen door. Some nights I throw her scraps, and over the years I’ve learned what she likes and doesn’t. She won’t eat dog food or fruit. She definitely likes fish and (unseasoned) meat scraps. 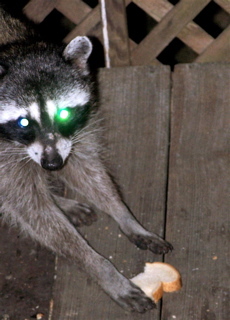 But her favorite fare is bread — not that healthy, whole-grain stuff but cheapo bread with the consistency of cake. 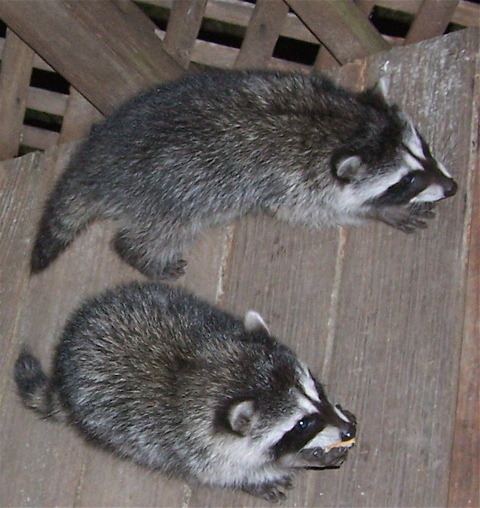 Three kits hide behind the woodbox on my deck Sunday. I later got out a tape measure and found the gap they’d been in is only four inches wide. 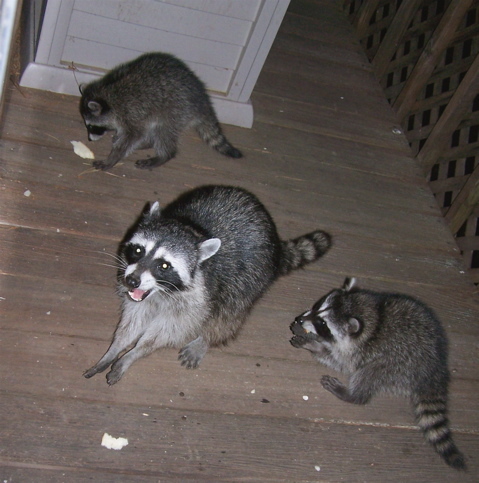 Mrs. Raccoon and two kits beside my woodbox Tuesday night. The youngsters are about the size of six-month-old housecats. Late in the evening, a male raccoon (left) sometimes shows up begging, but he’s more skittish and is easily intimidated by Mrs. Raccoon if she’s around. Which is probably why he usually waits until she’s gone. For three weeks last month, I watched helplessly as he contended with a tick attached to the bridge of his nose. Finally, he managed to scrape it off — but lost a couple of patches of fur in the process. Sparsely Sage and Timely is powered by	WordPress 4.9.10 and delivered to you in 0.485 seconds using 52 queries.